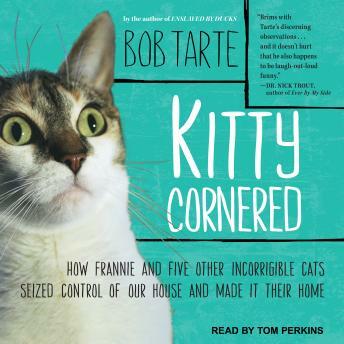 Bob Tarte had his first encounter with a cat when he was two and a half years old. He should have learned his lesson then, from Fluffy. But as he says, "I listened to my heart instead, and that always leads to trouble." In this tell-all of how the Tarte household grew from one recalcitrant cat to six-including a hard-to-manage stray named Frannie-Tarte confesses to allowing these interlopers to shape his and his wife's life, from their dining habits to their sleeping arrangements to the placement and furriness of their furniture. But more than that, Bob begins seeing Frannie and the other cats as unlikely instructors in the art of achieving contentment, even in the face of illness and injury. Bewitched by the unknowable nature of domesticated cats, he realizes that sometimes wildness and mystery are exactly what he needs. With the winning humor and uncanny ability to capture the soul of the animal world that made Enslaved by Ducks a success, Tarte shows us that life with animals gives us a way out of our narrow human perspective to glimpse something larger, more enduring, and more grounded in the simplicities of love-and catnip.